The Catholic Church retains a significant degree of influence in Slovakia. Religious opposition to divorce in part explains the continued conservative approach to the law in this area. Couples who wish to divorce must prove to a judge that the marriage is dysfunctional, even if both parties agree to a divorce. In 2015 only a tiny percentage of the 10,000 or so divorce petitions were refused by the court. This has led to some criticism of the necessity for couples to prove their eligibility for a divorce and the resulting delays and expense. The community property regime that exists during marriage is dissolved on divorce. Under the Slovakian Civil Code there is a presumption that property should be divided equally. Each spouse must compensate the other for any personal assets that were invested in community property. Couples have three years from the divorce to either agree how all property should be divided or ask the court to make an order. If they don’t there is a presumption that personal property belongs to the spouse who uses it for his or her daily needs. Real property is deemed to be owned equally. 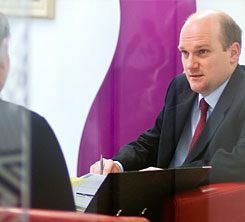 We are specialist divorce solicitors and family lawyers and we advise clients who have a connection with Slovakia. Our clients can include those who are UK–based but originate from Slovakia, are living in Slovakia but have a connection with England or Wales, were married in Slovakia, or have other family connections with Slovakia. “When I sought Julius’ help I was confused, angry and had no idea how to respond to a court summons issued against me in Romania. Julius was calm, clear and extremely helpful. He kept me updated on what I needed to do. He was also very clear from the very beginning about the costs, and about the options that were available to me.